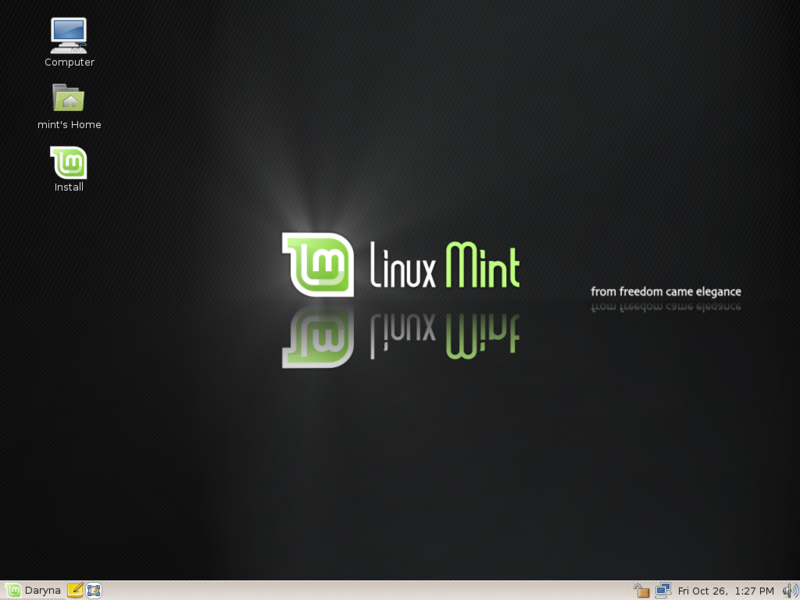 This is Linux Mint 4.0, codename Daryna, based on Celena and compatible with Ubuntu Gutsy and its repositories. Daryna is using Gutsy's package base (kernel 2.6.22, Gnome 2.20, OpenOffice 2.3, Thunderbird 2.0...etc). 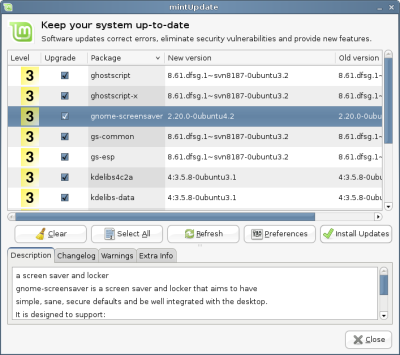 With mintUpdate you can now get automatic updates without compromising the stability of your system. 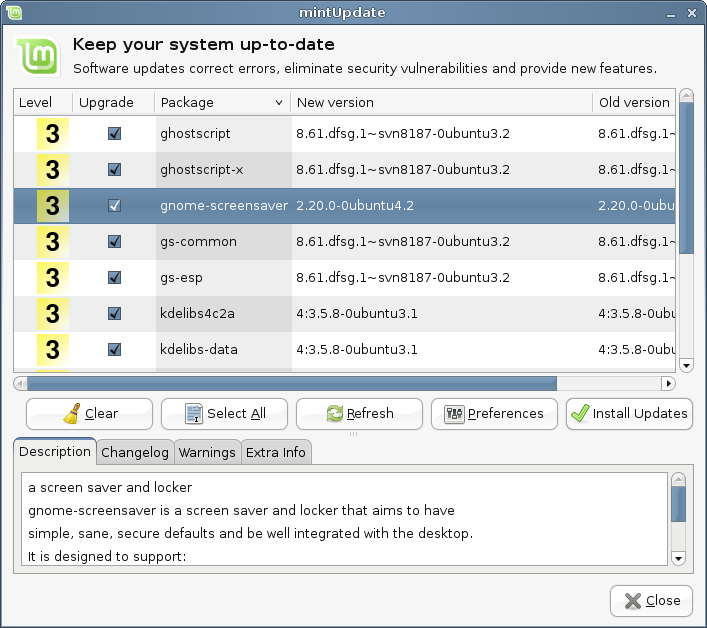 Updates are assigned a security level which indicates how safe they are for you to apply. MintUpdate also brings you more information about the updates and the risks involved in applying them. MintUpdate is also highly configurable and you decide which levels you want to see and which you want selected by default. 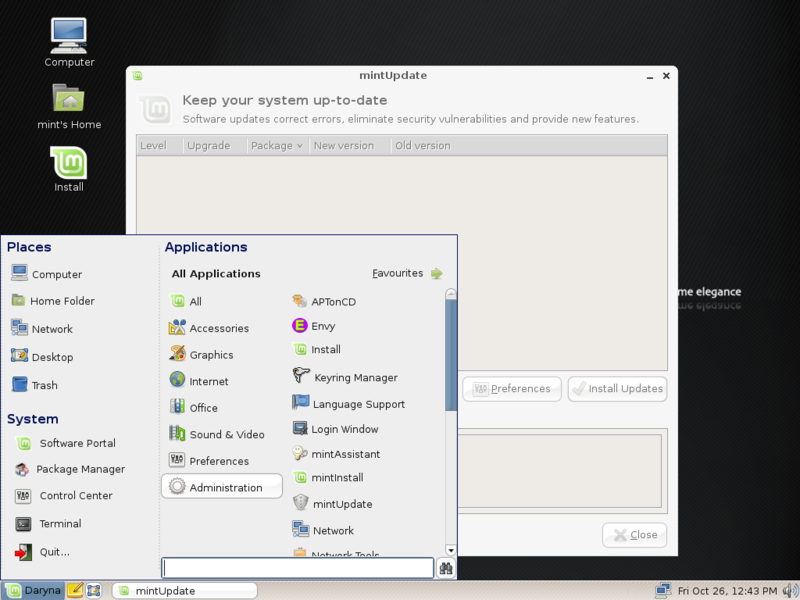 The implementation of mintUpdate in Daryna follows the decision to remove the Ubuntu Update Manager in Celena because it didn't give enough information about updates and assumed all updates were without risk for the user's system. 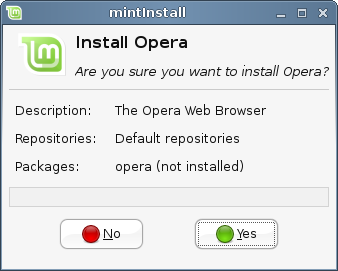 mintInstall itself was also made more intuitive and improvements were made to its interface. In the backend, mintInstall now also relies on Synaptic and brings improvements on how it handles downloads/installations of packages and hotplugging of repositories. Visit the Software Portal and don't hesitate to use the forums to request any piece of software you would like to see added. 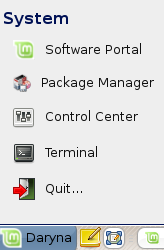 Linux Mint now includes the Red Hat Liberation Fonts, consisting of three sets of fonts: Sans (a substitute for Arial, Albany, Helvetica, Nimbus Sans L, and Bitstream Vera Sans), Serif (a substitute for Times New Roman, Thorndale, Nimbus Roman, and Bitstream Vera Serif) and Mono (a substitute for Courier New, Cumberland, Courier, Nimbus Mono L, and Bitstream Vera Sans Mono). Many thanks to Red Hat for making these fonts. Credits go to Xorg, Compiz Fusion and Ubuntu for bringing us the best 3D effects available and activated out of the box in Daryna. Linux Mint is now using pinning between its own repositories and Ubuntu/Medibuntu repositories. Backport: To allow optional backports for older releases. What makes Daryna ideal for the desktop? On computers with Dell Recovery Partitions: Manual Install might not work in the liveCD installer. To fix this issue: "apt purge ubiquity; apt clean; apt install ubiquity" then perform the installation and restore the sources.list from the liveCD to the installed system. 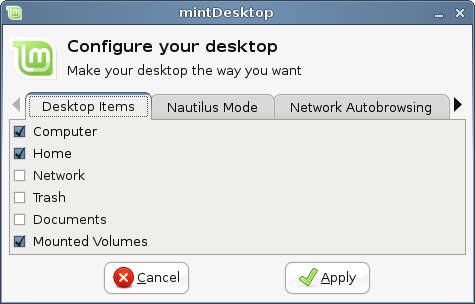 On some hardware with ATI/nVidia cards: If the liveCD boots all the way to Gnome but hangs and just shows the mouse pointer and eventually the wallpaper, restart the liveCD, press F6 and change the options "quiet splash --" with "nosplash noapic noacpi --". Can you upgrade to Daryna? Should you upgrade or install from the CD? We strongly recommend fresh installs (downloading the CD and installing from it). 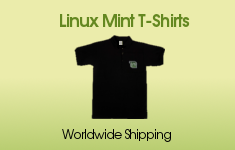 A fresh install gives you a complete Linux Mint system with all its default settings and artwork and in a state that we have successfully tested. By performing an upgrade you only update important pieces of the system and your own settings are preserved (this means for instance that you don't necessarily get the new artwork). Of course with a fresh install you loose all your installed applications and system settings and you may not want to go through that again. For this reason we're publishing this howto. Remember though, this is a best effort, only recommended to people who are experienced with APT and who are not afraid to use the command line. As with a freshinstall we recommend you backup your data before you proceed with the upgrade. Good luck and enjoy Daryna. How to upgrade from Celena? How to upgrade from Daryna BETA 021?